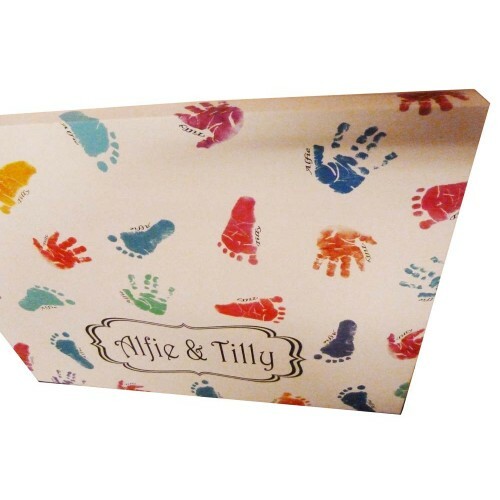 Have a gorgeous giant canvas of your child's hand prints and footprints made into a luxury, giant personalised box canvas, creating a luxury, personalised keepsake to treasure. 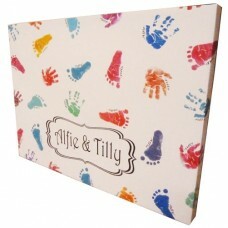 This personalised hand & footprint canvas is a giant approx. 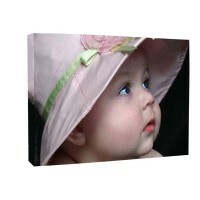 20"x15" 500mm x 380mm (which is approximately A2 size) Deep Box Canvas and is superior quality, it is fade resistant and created using quality inks to ensure a vibrant print and with our advanced technology we are able to digitally enhance your picture for an amazing finish and bring out the best detail for you. 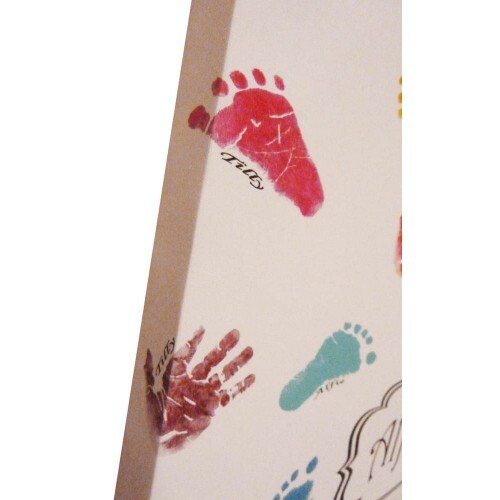 We use 30mm depth box canvases for a really deep, luxurious finished product, we can turn your child(ren's) hand prints and footprints into a luxury, colourful baby keepsake, a really unique art piece from your child(ren)'s hand and footprints, all we need is some really clear hand and footprints from you (to scale) to create these amazing keepsakes, remember that we need a good quality image from you to produce the best finished results, if you need an inkless wipe kit to take some clear prints, then please click the button to order this and this will be sent first, you will then need to take the prints and return them to us, or send us a high quality scan in order for us to produce your keepsake, one of our keepsake artists will adjust your prints so that they are of an extremly high qualty and that the detail captured can be seen clearly, they take the time to ensure that your prints look amazing before your final draft is produced, they are highly skilled to produce the best results for you. 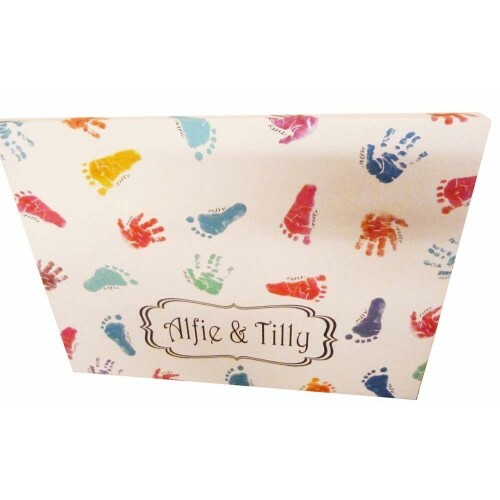 We can create your hand &/or footprint canvas in portrait or landscape and we can create it in vibrant colours, simply order your print taking kit, or upload your picture(s) and let us do the rest for you. 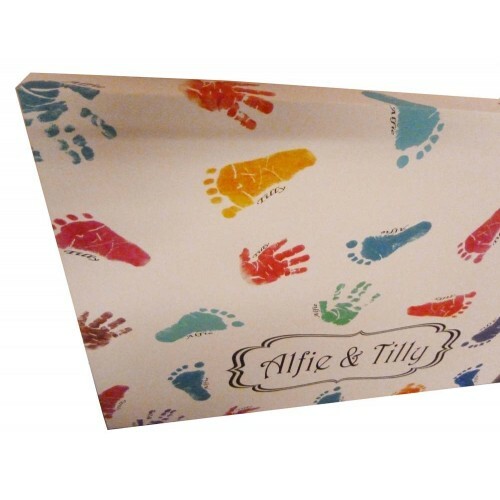 We offer two styles of canvas, you can either have a gallery wrap, which involves wrapping your photo around the sides of the canvas as well as the front; or it can be finished with a white edge if you prefer, this is where we leave the sides white and your prints will just cover the front of the box canvas, please remember to select which option you prefer from the drop down box. Please allow up to 14 working days for your order to be completed, although orders are generally dispached much sooner than this, except at very busy times like Christmas and Mother's Day. This price includes FREE UK Mainland postage. 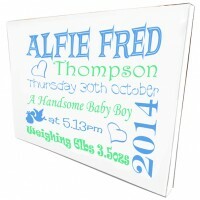 Have your birth details made into a luxury, giant personalised canvas, creating a luxury keepsake to..
Have a gorgeous photo made into a luxury, giant personalised photo canvas, creating a luxury keepsak..